Alington County is helping bike commuters by promoting its "Bike Vs..." challenge. BikeArlington will help commuters figure out how they can get to and from work via bike. They say bikes are faster. All you need is a commute that starts or ends in Arlington, but I say ARLandria is close enough. (CommuterPage). Disney is promoting volunteerism by giving away a day at its parks in exchange for a day of service to an eligible volunteer organization. There are over 600 opportunities nearby. Give a day. Get a Disney Day. First Lady Michelle Obama visited our local Y to kick-off her obesity and fitness campaign. Top on her list of recommedations: "Improving our Communities". (AlexandriaNews and press releases). Two items of local interest are on the Planning Commission docket for Tuesday, February 2nd. 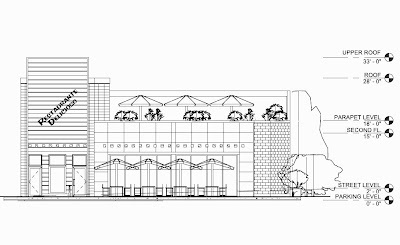 Chez Andree wants outdoor dining and a chicken rotisserie restaurant wants to build next door to the Lube-it. Here's the chance to weigh in. While the H1N1 flu seems to be decreasing, it is still early in the influenza season—and the virus could become more widespread again. Getting a vaccination now will prevent you and your loved ones against another round of H1N1 flu. The H1N1 flu vaccine has now become more available to the general public, and the Alexandria Health Department Casey Health Center is now offering H1N1 flu vaccinations to everyone. Last month, Lynhaven was featured in the Washington Examiner's Real Estate Section. For those of you who are not familiar, Lynhaven is just north of Del Ray, across Route 1 from the Potomac Yard shopping center. The article describes Lynhaven as an affordable transitional neighborhood close to DC. 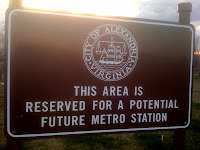 It highlights the rising popularity of the area, especially with the possibility of the Potomac Yard. Most notably it describes the rising property values and amenities in the area. rooms and decorators who’ve “provided unique ideas for nominal cost.” Advertisements offered homes for payments of as little as $31.65 a month." Positive Press for Alexandria is ALWAYS beneficial! See what's planned for the Calvert. As first shown here on the Arlandrian, Representative from UDR, owners of the Calvert apartments and shops on Mt Vernon Avenue are presenting their current plans for renovating and expanding their aging building on Tuesday night (January 19th) at Cora Kelly Rec Center following the monthly membership meeting of the Hume Springs Civic Association. The Civic Association meeting is at 7pm. The UDR presentation on the Calvert begins at 8pm. If you were thinking about going for a swim, think again. On Friday, Arlington County issued an advisory cautioning residents to avoid Four Mile Run following a sewage release upstream. The source of the sewage is under investigation. See the full press release for more info. Is there money on the way for a Potomac Yard Metro? The Washington Post reported on Thursday that about a shift in Federal funding rules that could help aid area transit projects. Would this help solve the $30M funding gap? Embracing Four Mile Run restoration. The Sun Gazette reports that, "The Northern Virginia Conservation Trust has detailed plans for a new initiative designed to create a regional network of green spaces in Northern Virginia." Among three other projects embraced as part of the initiative, the Trust identified the Alexandria Green Crescent as part of this broader initiative. 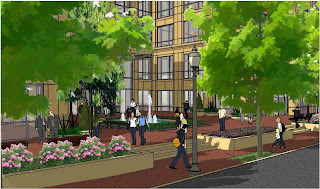 Alexandria's Open Space plan describes the goal of creating a "Green Crescent of open spaces that follows the alignment of the City's primary rivers and streams: Potomac River, Four Mile Run, Cameron Run and Holmes Run. The Green Crescent would be created by building upon the existing parks, natural areas and other open spaces, and by adding unprotected key sites to provide greenway and trail linkages and interconnected parkland." Del. David Englin (D-45) who represents nearby portions of Alexandria, Arlington and Fairfax County, has introduced legislation to reform the barrment process used by public housing authorities and police in Virginia to deal with crime issues at housing projects. Residents think the current system is unfair. The local police union says otherwise. DCist profiles the Carolina Chocolate Drops in advance of the upcoming show Monday night at the Birchmere here in Arlandria. With bike and pedestrian issues being so important to our neighborhood, I hope some noted that the Alexandria Pedestrian and Bicycle Citizens Group met at 7 pm tonight (Monday, January 11th) at the Durant Center, 1605 Cameron Street. Special guests were John Komoroske, chairman of the Planning Commission, and Jayme Blakesley, vice-chair of the Transportation Commission. Mr. Komoroske and Mr. Blakesley explained how their commissions shape policy and approve projects or plans that directly affect bicyclists and pedestrians in Alexandria. If you still have a Christmas tree hanging around, you can still set it out for recycling collection on Saturday, January 16th. All trees will be ground into mulch. Please remove all ornaments, tinsel, and stands, before placing them on the curb. Have you been buzzed lately? The Sun Gazette mentions that the Arlington County Civic Federation, on Jan. 5, overwhelmingly adopted a resolution requesting the county government and Metropolitan Washington Council of Governments to work with federal officials on an effort to mitigate noise from military helicopters in the community. The same helicopters make the same noise on this side of the border. Arlington County Board Member Chris Zimmerman, says "It is easy to imagine extensions from this initial segment" when asked about extending the planned Columbia Pike street car line down Route 1 to Potomac Yard. (Chris Zimmerman answers the rest of your questions, Greater, Greater Washington). Alexandria City Council is accepting applications for the many openings on the City's boards and commissions through Friday the 15th. A couple of these are reserved for North End residents. The Park and Recreation Commission has a vacancy for one Planning District II representative (which includes zip code 22305), due to an expiring term. The Commission meets on the third Thursday of the month at 7:30 p.m. The Commission requires approximately eight hours per month of its members. Potomac Yard Area, due to an expiring term. The Committee meets at the call of the Chair. A lot of folks are talking about what might be happening at Popeyes. The Arlandria location closed just before the New Year. 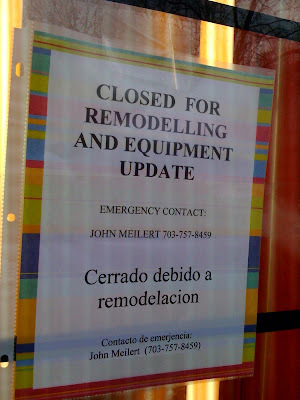 A notice has been posted that they are simply undergoing a re-do. Local State Delegate and North End resident, Adam Ebbin has introduced a measure hoping to curb the litter that plagues our streets, parks and streams. Ever since the Hume Springs Heroes did their clean-up in Four Mile Run Park, the Alexandria side of the park is looking much better than that of the neighboring jurisdiction, where it looks like New Year's parties are still raging. Numerous trash cans are over-flowing. Come on Arlington, the North End has thrown down the work glove. Can you pick up the beer cans? My neighborhood isn't the world's best, but nor is it the world's worst. After dark, the streets fill with dog walkers. A couple per block, at least. In the winter, they're the only people on the streets. Without them, the neighborhood would be lot emptier, and the streets would feel a lot more forbidding. One of the key crime prevention techniques is increasing the number of "eyes on the street". One way to get this is to build street fronting businesses. In residential neighborhoods, this isn't an option. Dog owners are habitual walkers, because their dogs will generally drive them nuts without the periodic w-a-l-k. I don't own a dog, but I dog sat for a month for a friend in the hospital and occasionally for the in-laws, and I walked their dogs twice a day, every day. I have too small a yard to get a dog any meaningful exercise by just putting them out back, so I had no choice. My wife and I are walkers anyway, frequently heading to Shirlington, Old Town, or just a loop through various neighborhoods at least weekly. Still, we have never walked as frequently as when we were dog sitting. Most neighborhoods as close to DC as Arlandria have to fight and scrap for every piece of open space they can, but the City found itself the proud new owner of a former Dominion Power substation site this past year (map of site with possible dog park superimposed). Since then, Dominion Power removed the substation, remediated the polluted soil, and seeded the property. It is now officially City open space. The problem with the space is that, with a curtain of dense trees blocking views into the entire space, it provides a hidden pocket for criminal activity. Additionally, it doesn't lend itself to too many things as it is too small and broken up by those same dense trees. In the blog linked at top, Mr. Klein jokes that "the city is building a big park/open air drug market near my house." He goes on to explain that the park he's referencing might actually work because a dog park, playground, etc. will create a place people will use and that alone deters crime. Now that we're left with our new open space, we need to find a way to get a use out of it so it doesn't become a magnet for problems. Based on a conversation I had with our community officer, he hopes for a fenced use so that it can close after hours and trespassing becomes more enforceable. Readers of the Arlandrian will probably remember a dog park survey and results summary article from last year. If not, here is the link to the post. To avoid repeating myself, please give it a read. The Reed Ave site provides us a centralized location between densely populated neighborhoods that is far from any other fenced-in dog park. The neighborhoods are shaking off crime problems of years past and the extra eyes on the street are exactly what we need. The City might have other long-term ideas for this property, but, at least for the interim years, why not provide the amenity on a site that will receive little use, otherwise. By installing a fence, a trash can, and mulching over most of the site, it could be quickly and cheaply turned into to a dog park. I've spoken to the chairman of the Parks and Recreation commission, City Council members, and the City's Open Space Coordinator. Some City Councilmembers seemed amenable to the idea. However the idea of a temporary Dog Park makes some people nervous. Removing it later could get ugly, even if people are warned of its temporary nature on a daily basis through signage. The key here is that everyone maintains an open mind. City staff should understand that a dog park could fill a need for some people temporarily and citizens should understand that the site might eventually be used for a more pressing need. That said, the fenced-in dog park could become hugely popular and become a permanant fixture that fills a pressing need. Time will tell. The adjacent apartment complex, Glebe House, sent a letter to the City requesting the space not be used for a dog park, but the majority of citizens that replied to the survey in September (both dog owners and non dog owners) picked a fenced dog park as their preferred use for this location. We even had a number of people contact us to volunteer to help should we get the City to approve the creation of a fenced dog park at this location. The site's proximity to the apartment is a problem that doesn't jibe with the City's Dog Park Guidelines (recommend a 50 ft setback), but the guidelines don't take things like greenscreening the site with trees and shrubs into account. They are just guidelines, after all. I've contributed my input to the Park and Recreation Commission, so we should have at least some feedback in the next few weeks. If you'd like to provide input to the Commission, member e-mail addresses are located at this link. Coming up next week, you can catch a deal at one of the Alexandria Restaurant Week participants. RTs is the only Arlandria establishment taking part, but they are offering a four course meal instead of the normal three courses for $35. 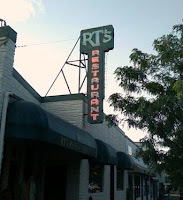 If you haven't tried RTs, it's a great creole/cajun restaurant right in the heart of Arlandria. 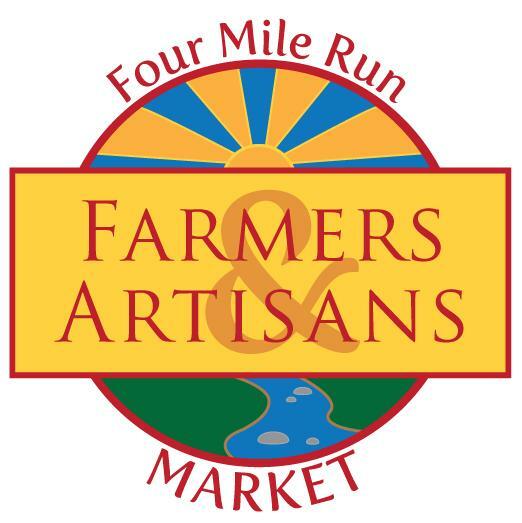 Just a short walk away, 2 highly rated restaurants located at the base of the Calvert are also participating: Del Merei Grille and Bombay Curry Company (offering the $35 dinner for two option). Numerous other nearby Alexandria restaurants also participate. Alexandria Restaurant Week returns from January 15-24. Enjoy a three-course menu for $35, dinner for two for $35, or a sweet treat for $3.50! More than 50 restaurants are participating in this 10-day gourmet and gourmand event, which showcases the inventive culinary diversity offered throughout the City. Concept.0 Eco-Designs, LLC architect Mabel Tweddle held a community forum to preview the design for a new Peruvian chicken restaurant at 3401 Mt. Vernon Ave (street view). The focus was on a mix of sustainability and quality design. Many such restaurants are content to find an abandoned fast food restaurant or a spot in a strip mall, but the owners of this restaurant-to-be seem to want to be more than just another quality cheap-eat. They are enhancing the street scape by building the patio up to the property line and lining it with planters that will be filled with "herbs and flowers". They also plan to provide "green screening" by landscaping the area between their restaurant and a neighboring oil-change shop. Four off-street parking spots will be located behind the building and out of view. The building itself will be one story with a partial second story outdoor deck. There will be a basement for storage. 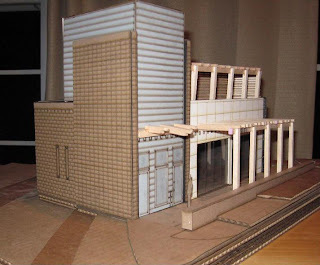 The building finishes being planned are primarily split-face or polished masonry block (similar to pavers) with a 2-story metal panel cladded entrance feature and an accent color panel system on the front (showed a red sample color at the meeting, but that's not final). There will be ample outdoor seating divided between a patio and a 2nd story deck, which will both be under wood trellises. The design is contemporary urban, fitting in nicely with the primarily art-deco feel of Arlandria and Del Ray. Sustainable (green) initiatives being considered include low maintenance exterior materials, efforts to retain and treat storm water runoff on site and controlling the lighting so that it creates a welcoming environment without excess brightness. One person recommended they follow "dark sky" practices to minimize wasted light sent upwards that adds to light pollution. Citizens seemed happy with the potential addition to the neighborhood. Primary citizen comments focused on operational details, such as how they would handle deliveries, trash and recyclables disposal and keep people from walking off site with alcohol. However, there were several comments that could contribute to productive tweaks to the design. 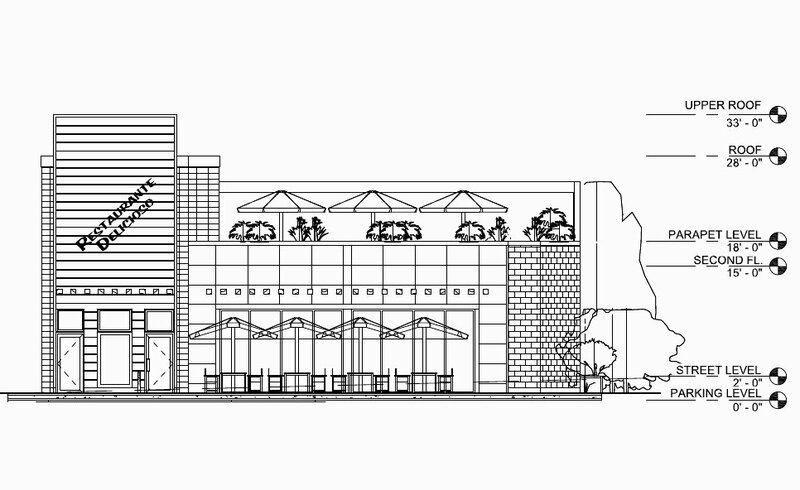 The plan includes bike racks in the back near the parking, but after numerous comments expressing interest in keeping bikes within view of patrons, the architect said she would attempt to incorporate that into the design. Another suggestion made by a neighbor with extensive architectural and development management experience was to forgo some of the expensive high tech stormwater runoff management solutions for a simpler underground system that allows water from the property to be collected under the parking lot and slowly infiltrate into the soil following a storm. He stated this solution could save the developers significant investment with a similar outcome. Both citizens and the architect found it to be a positive and useful meeting. The owners seem to want the restaurant to become a part of the community and something we can all be proud to patronize. The restaurant is up for SUP approval in February. There was no name identified, as of yet. They hope to be open and operational next winter.